What is the Lincoln Log? The Lincoln Log: A Daily Chronology of the Life of Abraham Lincoln incorporates Lincoln Day-by-Day: A Chronology, compiled by the Lincoln Sesquicentennial Commission with the cooperation and support of... the Abraham Lincoln Association and published by the Government Printing Office in 1960. 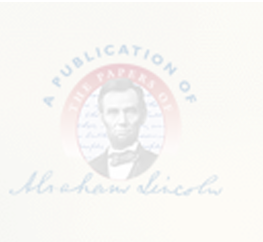 The text presented here includes all entries from that publication, with corrections and additions by the Papers of Abraham Lincoln, a project of the Illinois Historic Preservation Agency and the Abraham Lincoln Presidential Library and Museum. This electronic publication is redesigned by Balance Studios and is hosted by IDM USA. From 2007 to 2012, the National Center for Supercomputing Applications at the University of Illinois at Urbana-Champaign hosted The Lincoln Log, and from 2003 to 2007, the Scholarly Technology Group at Brown University hosted it. The staff of the Papers of Abraham Lincoln will continue to update and supplement these entries as new materials become available. Several individuals have already contributed new information and corrections to the ongoing updating of The Lincoln Log. Please send corrections and additions with documentation to the Papers of Abraham Lincoln for consideration.